Ignorance Promotes False “Unity” – Conformity to Falsity. Knowledge Promotes True Unity – Conformity to Truth. Less awareness of reality is ignorance & less points of possible conflict. Blank page “unity” is easy, it is a false self “unity.” More awareness of reality is knowledge & more points of possible conflict. Shared quality knowledge, truth, is the way to True Unity. The strength, solidity, integrity, quality & groundedness of Unity within ourselves, with Truth & Morality, and with each other, is based on the quality knowledge of Truth & Morality we take in. The more ignorant of Truth & Morality someone is, the more holes they have in their foundation, and the weaker their attempts at “unity” are. The ignorant masses are living the same relative program of the false self, in false negative knowledge of various kinds. The ignorant masses are more united from their ignorance. 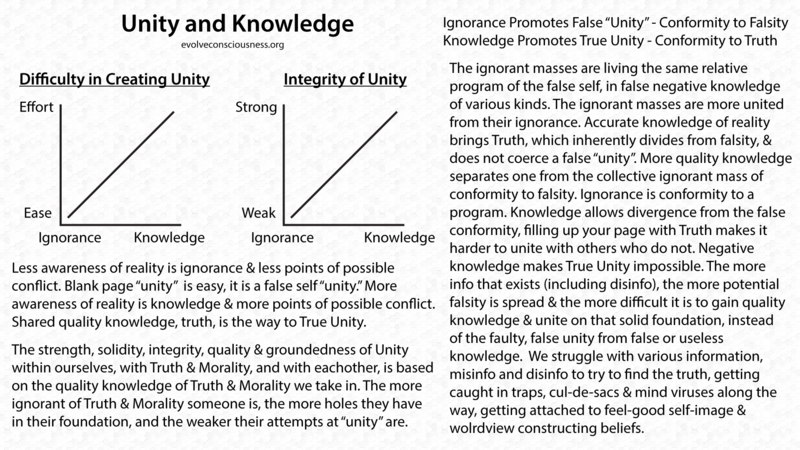 Accurate knowledge of reality brings Truth, which inherently divides from falsity, & does not coerce a false “unity”. More quality knowledge separates one from the collective ignorant mass of conformity to falsity. Ignorance is conformity to a program. Knowledge allows divergence from the false conformity, filling up your page with Truth makes it harder to unite with others who do not. Negative knowledge makes True Unity impossible. The more info that exists (including disinfo), the more potential falsity is spread & the more difficult it is to gain quality knowledge & unite on that solid foundation, instead of the faulty, false unity from false or useless knowledge. We struggle with various information, misinfo and disinfo to try to find the truth, getting caught in traps, cul-de-sacs & mind viruses along the way, getting attached to feel-good self-image & wolrdview constructing beliefs.